I knew before venturing out on this years coaster extravaganza that I would be paying very close attention to the way we were treated by the employees at the various parks we visited. With long drives between some of the parks, my friend Alan and I had ample opportunity to dissect our experiences, and continually came back to one conclusion. Kordell at Six Flags Over Texas is a ROCK STAR. He was by far the standout employee at the six parks we visited. We were going to get the Gold (mid tier) pass. Kordell noticed that Alan had an annual pass, and said with that discount we could get the Platinum pass for just a little more. In the same breath he rattled off the benefits of the Platinum, which were very appealing to us. He then said, “If you have a Discover card, I can take another 5% off!” We did, and he did. When all was said and done, he wished us a great day. Alan and I walked out of the office commenting about how fast, friendly and knowledgeable Kordell was, AND the fact that he upsold us (which we agreed doesn’t happen that often)! But, the story doesn’t end there. The Platinum pass allows you to reserve a time on the Texas Giant (this was the day before the very unfortunate incident at the park) to minimize waiting. To reserve this time, we had to go back to the Flash Pass office. Each time we did, Kordell remembered us, greeted us with a big smile and took care of our request. We left the park for lunch, and had to turn in the Flash Pass device – who was there? Kordell, rocking the house. 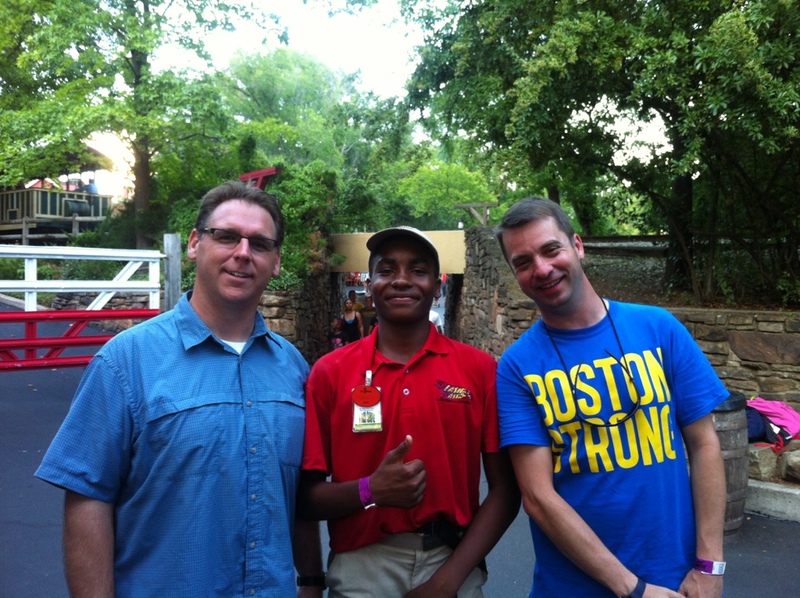 At one point in the early evening, we went to see Kordell again for a reservation for the Texas Giant. We didn’t know it, but it had closed temporarily and was not taking reservations. Kordell knew that, and instead set our device for a reservation for Titan (another great coaster at SFoT). He could have simply handed the devise back to us and sent us on our way, but instead he took it upon himself to make up for the fact that we couldn’t do what we originally asked for. We were surprised and excited, and of course immediately made a bee line for Titan! The picture above was taken when we ran into Kordell just before getting on the Texas Giant for our last ride of the night. He was out in the park sweeping, but he was still smiling. When we mentioned how much we appreciated his service that day, he immediately (and proudly) told a co-worker standing nearby. You could tell that he was happy that someone noticed his efforts. When we turned in the Flash Pass device at the end of the night, we met Eric, Kordell’s supervisor. He said that he had met Kordell when he was 15 and that he was eager to work, but too young to hire. Eric told him to call him as soon as he turned 16 and he would hire him. Alan and I are sure glad they both followed through! If this experience confirms anything, it is the importance of hiring the right people. Kordell showed signs of excellence long before he was even hired, and that translates to his performance on the job. It’s also obvious that Kordell enjoys what he is doing, and that speaks to the ability of his management team to make sure people are in the right places and doing jobs that line up with their skills and personality. Employees like Kordell are not always easy to find, and they will rarely be molded from someone who doesn’t have the desire or personality to perform. So how (and where) will you find your next Kordell? Are you currently looking? About the author: Matt Heller cannot magically make all of your employees perform like Kordell. He can, however, help you and your leaders figure out how to find the best talent and keep them motivated! We’re looking forward to seeing (and making) a lot of friends along the way! If you’d like to follow along, stay tuned to the blog or one of the social media channels below. If you live or work along this route, let us know so we can say hi! Many of us have probably heard that it’s important to remove the word “just” when describing what we do. I’m JUST an assistant manager. You can probably see where this is going. By including the word JUST in our description, we downplay our contribution and ability to be productive. Don’t believe this has an impact? It occurred to me the other day that JUST is short for JUSTIFICATION (at least that was the connection made in my brain!). When we say we are JUST an intern, it gives us JUSTIFICATION to not take initiative, not take chances, and not actually make a positive difference. It makes it okay to feel that you are helpless, that you have no say, and that what you do doesn’t really matter. Insert any position, job or role after the word JUST, and you have essentially nullified any chance of being successful. Why in the world would we want to JUSTIFY such a bland and unproductive existence? Maybe because it’s safe. Maybe because it keeps us warmly snuggled within our comfort zones. Maybe because that’s what we’ve been taught. If someone has said to you, “You’re JUST an employee”, even without further elaboration, you can kind of fill in the rest, can’t you? “You’re just an employee… your ideas don’t count.” You hear that enough and you start to believe it. You are now JUSTIFIED to feel that way yourself… ABOUT yourself. Here’s the trick – if you can JUSTIFY to yourself that you have very little worth, you can JUSTIFY to yourself that you have a great deal of worth – you just need proof. What do you do that’s great? What do you do that’s noteworthy? What do you do that makes other people smile, brings them joy, or helps them in their lives? Want to feel good about yourself? Look at this list early and often… that is your JUSTIFICATION!! Now let’s look at the statements above in a different way. Already there is more confidence and more authority. With that kind of outlook, you’ll feel much more JUSTIFIED in sharing your ideas and taking greater initiative. And that’s not JUST a theory, its a fact. About the author: Matt Heller is not just a blogger. He’s a BLOGGER!! Oh, and he’s also written a book you might like called the Myth of Employee Burnout (to be released later in 2013).